These golden muffins are good plain and even better dressed up with cream-cheese frosting (make half a batch). This recipe is from my friend Carrie, who used to own Florio Bakery in Portland. I adapted the recipe by reducing the sugar and adding whole-wheat pastry flour to the mix. Cream butter, sugar, and salt until combined. Add eggs, one at a time, then vanilla. Mix together dry ingredients in a medium bowl, then add to butter-egg mixture in three additions, alternating with carrot purée and milk in two additions. Stir in currants and walnuts. The batter will be quite wet. Spoon batter into prepared (greased and floured) muffin pans or silicone muffin cups. Bake for about 30 minutes, checking after 20 minutes, until a toothpick inserted into the center of a muffin comes out clean. 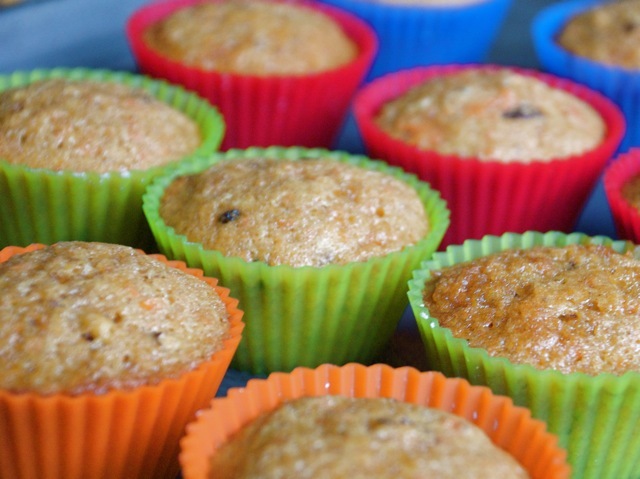 Allow muffins to cool for about 10 minutes before removing from the pan.